LoPro10™ provides a practical, economical alternative to a traditional radiator-based system and is designed for use with existing or new gas/oil/lpg condensing boilers. A LoPro10™ system typically requires a flow temperature of 45˚C–55˚C – much lower than a typical radiator system which would have a flow temperature of 70˚C– 80˚C and complementing the performance characteristics of condensing boilers perfectly. 1. 1st & 2nd fix work – Before installing the LoPro10™ system, carefully plan the installation sequence. Carry out any building work plus 1st-fix plumbing and electrical work. Clean the site and repair/level floors. LoPro10™ is a 2nd-fix product. 2. A clear site – To avoid damage and provide a clean working environment, where possible the site should be free of other tradespeople when installing the LoPro10™ panels, castellated pipe tray and self-levelling compound. 3. 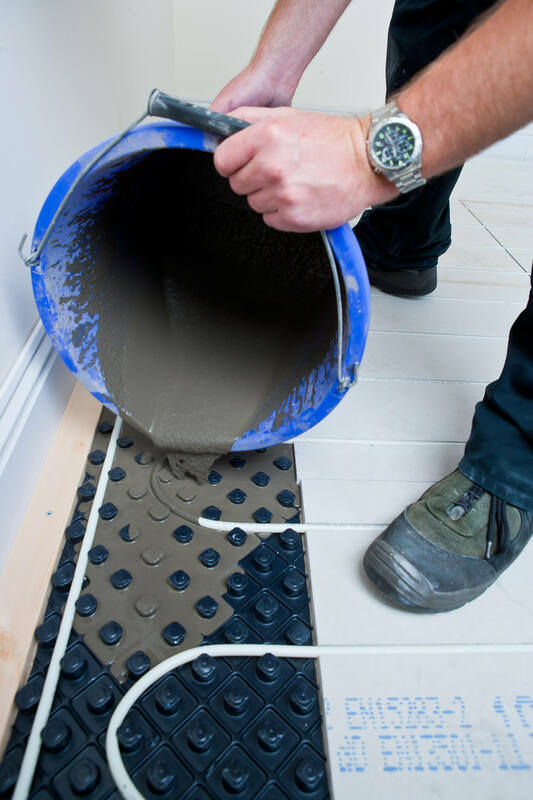 Floor preparation – Floor preparation/repair is essential for a trouble-free installation. Before laying any LoPro10™ panels the floor should be made flat/ level. Where necessary use an appropriate self-levelling compound to achieve this. Suspended timber and floating floors should be repaired so that they are flat and capable of providing sound load-bearing support. 4. 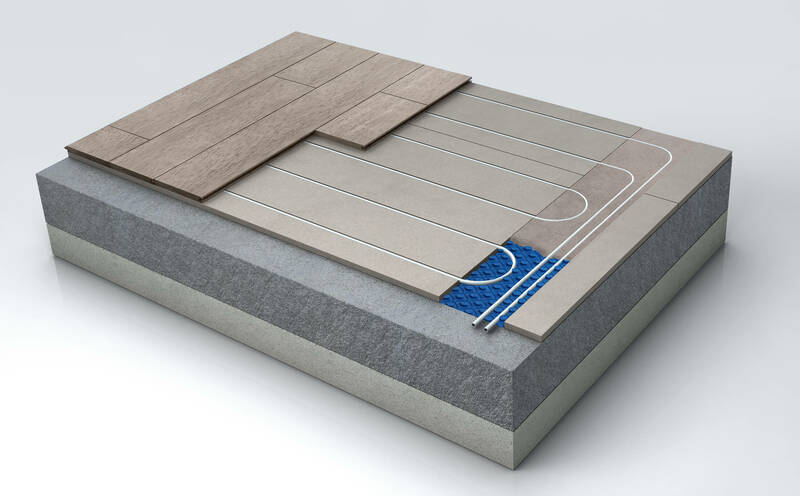 Floor finishes – Always ensure you use the laying/fixing method for the LoPro10™ panels that is appropriate for both the sub-base and the chosen final floor finish. Check the manufacturer’s recommendations for fitting final floor finishes in addition to those included in the Nu-Heat LoPro10™Installation Manual. 5. CAD design – Always review the CAD tube layout drawings supplied with the system; the floor areas covered by LoPro10™ panel and those covered by the castellated pipe tray are clearly indicated. Mark the areas out on the floor and double-check that the measurements match those on the CAD drawing. Any major anomalies should be discussed with the Nu-Heat system designer. 6. Edge battens – The edge batten placed around the perimeter of the room next to the castellated pipe tray can be used to determine the correct height for the self-levelling compound. Plug any gaps in the edge batten around corners to provide a tanking barrier; this will avoid the self-levelling compound escaping or sinking. 7. Thermostats – Nu-Heat supplies a wide range of thermostats with differing levels of complexity, therefore it is important that the homeowner chooses a model to suit their lifestyle and its operation is fully explained. The choice will affect the first-fix wiring. 8. Sensitive floor finishes – Advise Nu-Heat of any temperature-sensitive floor finishes, e.g. vinyl or engineered timber, as we will supply room thermostats that will control both the room temperature and limit the maximum floor temperature at no extra cost. 9. 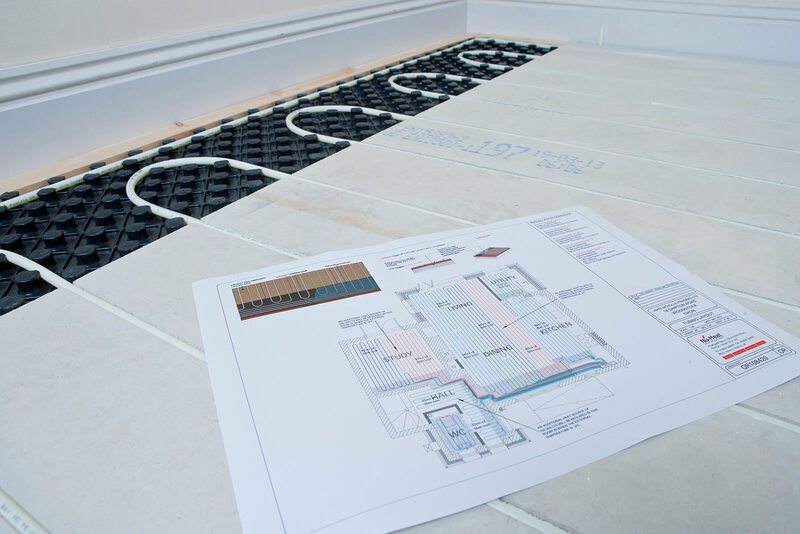 System programming – The LoPro10™ underfloor heating system should be run in a similar heating pattern as a traditional radiator system, with ON/OFF periods to suit the homeowner’s lifestyle. There is likely to be some fine-tuning required to align the system to the exact heat-loss characteristics of the building. This method of control is the most efficient for this floor construction in a renovation project. 10. Towel-rails – Building Regulations state that heated towel-rails should be fitted in bathrooms and en-suites, as they will support the overall heat output in the room during the winter months. They should provide a minimum of 400watts (depending on the size of the room). Towel-rails can be run traditionally as part of the heating system or alternatively oil filled electric models can be fitted.